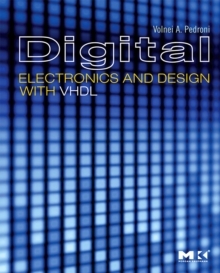 Digital Electronics and Design with VHDL offers a friendly presentation of the fundamental principles and practices of modern digital design. Unlike any other book in this field, transistor-level implementations are also included, which allow the readers to gain a solid understanding of a circuit's real potential and limitations, and to develop a realistic perspective on the practical design of actual integrated circuits. Coverage includes the largest selection available of digital circuits in all categories (combinational, sequential, logical, or arithmetic); and detailed digital design techniques, with a thorough discussion on state-machine modeling for the analysis and design of complex sequential systems. Key technologies used in modern circuits are also described, including Bipolar, MOS, ROM/RAM, and CPLD/FPGA chips, as well as codes and techniques used in data storage and transmission. Designs are illustrated by means of complete, realistic applications using VHDL, where the complete code, comments, and simulation results are included. This text is ideal for courses in Digital Design, Digital Logic, Digital Electronics, VLSI, and VHDL; and industry practitioners in digital electronics.